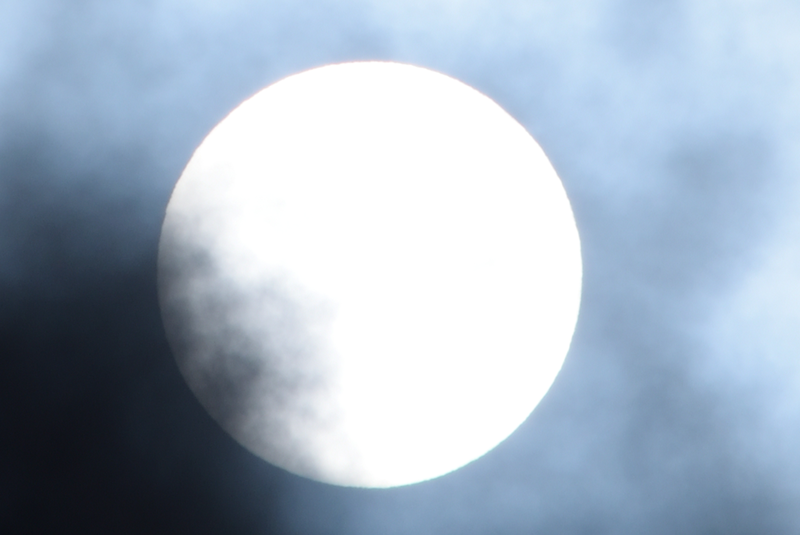 Sun with limb darkening seen through a thin fog. Gazing the Sun with the naked eye is dangerous. Much more dangerous is watching the Sun through the instruments like binoculars or telescope without the filter! It causes a serious eye damage, which is a retina burn and blindness for the rest of your life. Basically there are two types of solar filters: white light and hydrogen alpha (H-alpha). 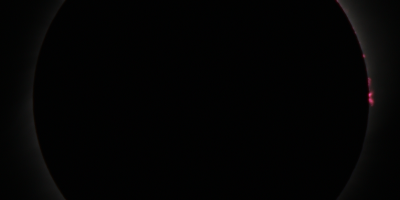 In this post I will mention only a white light filters. The white filters transmit the entire spectrum of visible light, which is next attenuated to a level making an observation safe. A filter designed for visual observation transmits only 0.001% of the solar light. The best and widely common used are Baader solar filters, that are both easy to buy and also easy to mount manually to your instrument. My observation of the Sun was specific and quite dangerous. I used a natural filter instead of the artifical types mentioned above. This natural filter is simply water vapor. Any cloud in Earth’s troposphere is comprised of the water vapour. However the Sun is not always clearly visible through them. Basic difference is in the special combination of particle size and cloud thickness (Lynch, Livingston, 1995). When in majority of cases the Sun behinbd clouds has a sharp edge, sometimes, especially through the altostratus clouds it looks fuzzy. 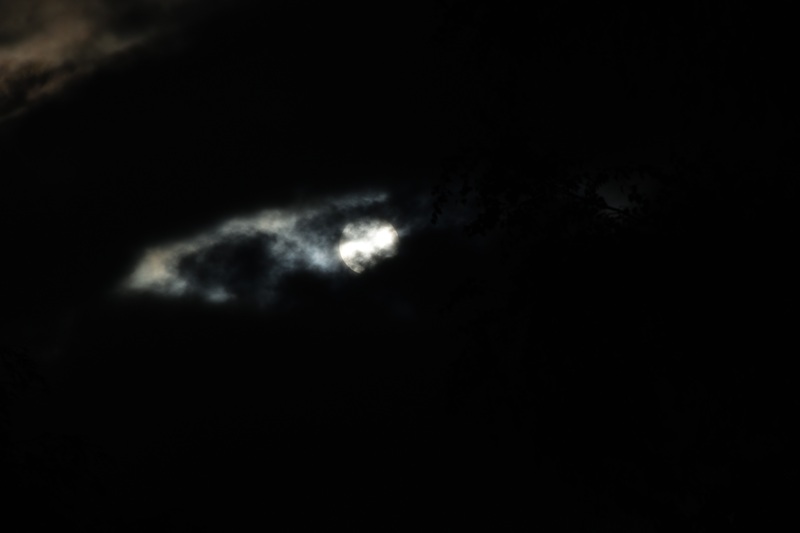 This is driven by the optical composition of the altostratus cloud. This cloud type contains a particles large enough to increase the optical thickness into moderate level. These large particles are caused by big layers both of raindrops and crystals, being common in the altostratus cloud. 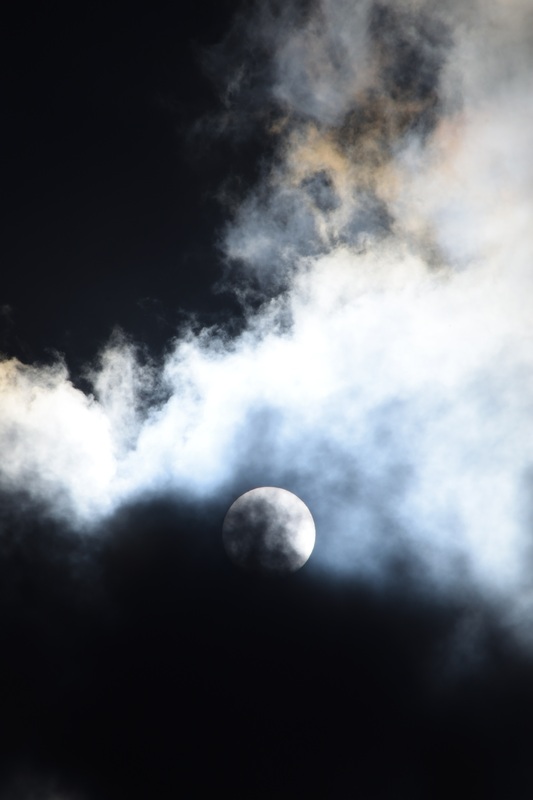 Other clouds can be composed of large particles also, but they are typically too optically thin to cause a fuzzy Sun, or too optically thick for the Sun to be seen at all (Liskens, Bohren, 1994). Some fuzziness of the Sun can be also caused by cirrus and cirrostratus clouds, that are comprised of the ice crystals, which optical properties are different than rainfall droplets. However in this case the Sun will appear still quite sharp, because this kind of cloud is not thick enough to produce the full fuzzy Sun effect, as the altostratus cloud can do. In the other hand this is the topic for a separate article. Comparing these all 3 basic types of cloud I can point the most convenient one. This is obviously the fog. 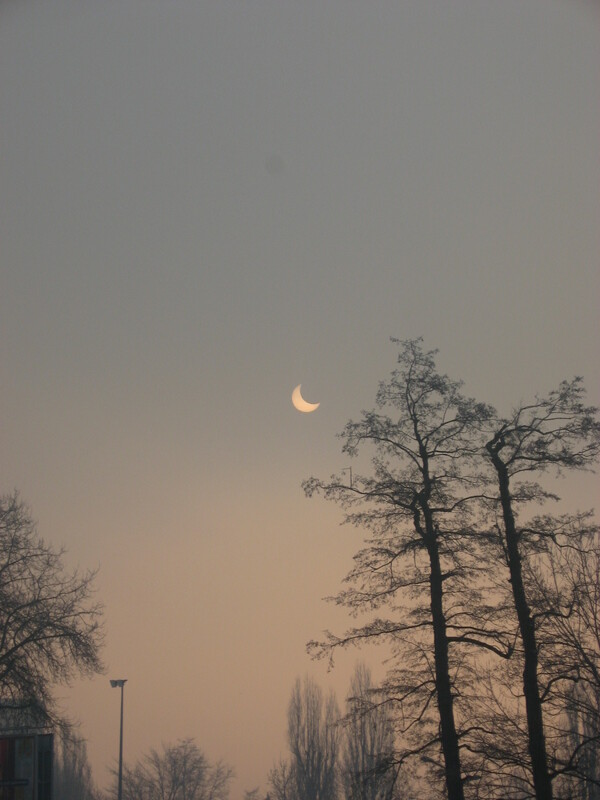 Fog gives an observer theoretically a consistent layer, which should provide a conditions safe enough to watching and capturing the Sun without the filter. The fog attenuation depends on the distribution of particle sizes. Usually a fog particles are bigger, than light wavelengths, so the Mie scattering plays a key role. Fog is usually described in terms of visibility, because the reduced visibility is the characteristic feature of fog (Chen, 1975). In this purpose is good to know the wavelength dependance of the extinction coefficient in fog (and also haze), which is shown below (Pic. 1). Pic. 1 Relative extinction of fog for different partile sizes depend from wavelength (Grabner, Kvycera, 2011). The graph above refers to any type of fog, containing small drop sizes (up to 10 um diameter) and concentration. For bigger particles (such 15-20 um diameter) the relative extinction coefficient remains almost constant. The Sun can be observed safely only through the stratus lowering fog (STL), being initiated by stratus cloud layer and mostly radiation fog. 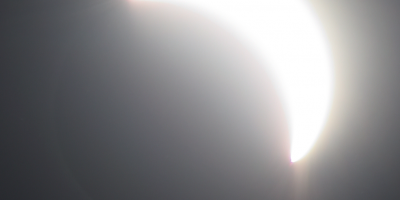 The minimu depth of the fog, which enable observer to watch the Sun safely without the filter depends on the liquid water density in this fog. The value of the liquid water density ranges up to 0.5 g/m3 for thick fog, cutting down the visibility to about 50m. For medium fog (with visibility up to 300m) these values will be much lower – about 0.05 g/m3. Another situation occur, when Sun rises higher and heat up the air, which cause dissipation, patchiness and next disappearance of the fog. 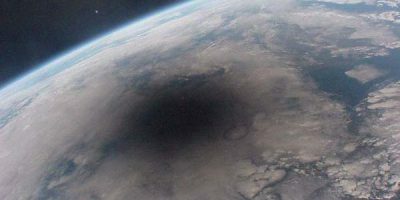 The observation of the Sun can be dangerous during this moment, because fog become patchy and a bigger amount of sunlight can go through some gaps. An observer must find the most appropriate moment for taking the decent image of Sun. Pic. 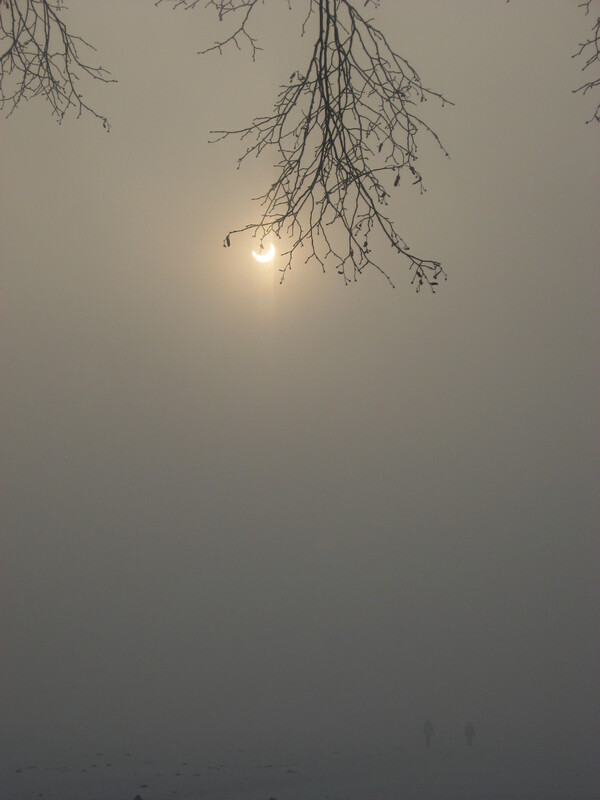 1, 2 Partial solar eclipse seen on 4.01.2011 in Kraków through the fog. 1 – The Błonia Park, 2 – Student Campus of AGH University. Click to enlarge. Another photography of the Sun was done in Cambridge on April 8, 2017 with using a Nikkor 55-300mm long lens. It was my first photo test before 2017 total solar eclipse in USA. That Saturday morning a thick fog covered the city at the early morning hours. 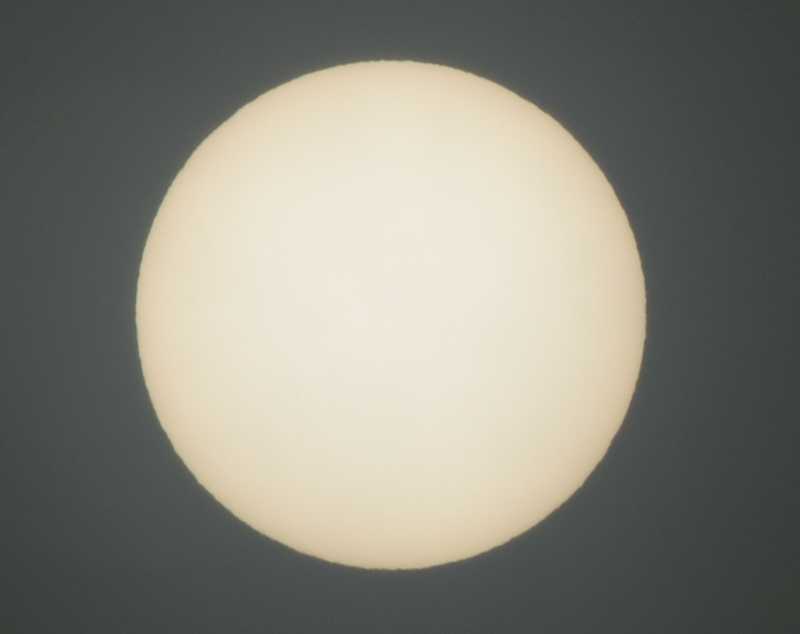 About 10am fog started to dissapear, making a perfect moment for capture of the solar disc. Pic. 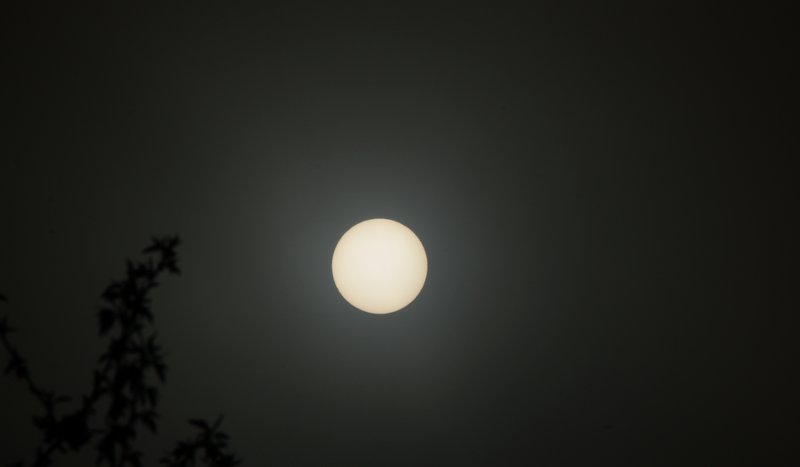 4, 5 Sun seen through a thick fog. Exif: 300mm, 1/1000s, f/10, ISO 100 (5-cropped). Pic. 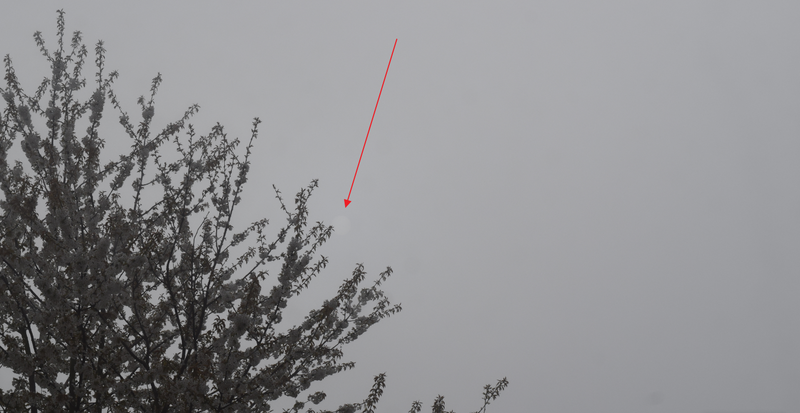 6, 7 Sun seen through a bit thiner fog, which allows to spot a limb darkening. Exif: 300mm, 1/1000s, f/10, ISO 100 (7 – cropped). Pic. 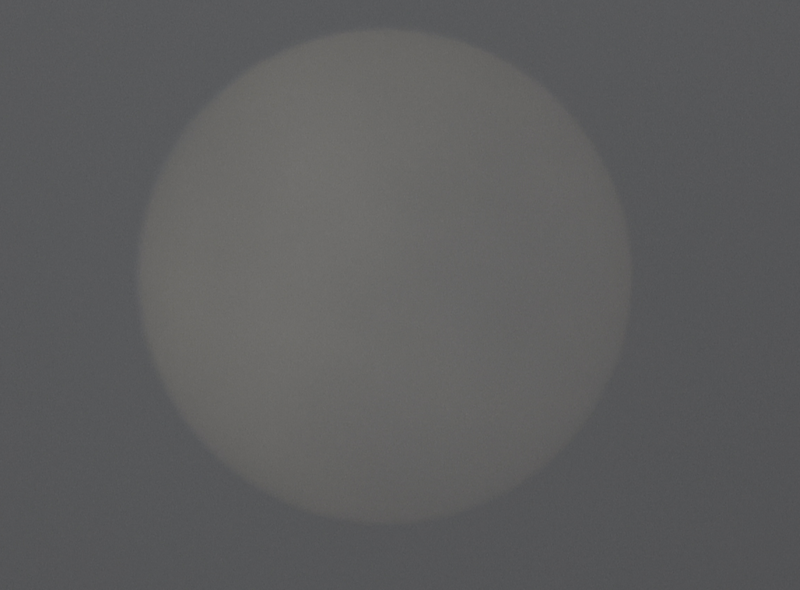 8, 9 Sun with limb darkening seen through a thin fog. It was the last moment for safe photography. A bit later the fog was too thin for this. Exif: 300mm, 1/4000s, f/29, ISO 100 (9 – cropped). The Pic. 8-9 show the last possible moment for both observation and photography of the Sun through a natural filter, which a fog is. A limb darkening phenomena is perfectly expressed on these images. Limb darkening is an optical effect seen in the Sun (likewise in other stars), where the edge of the disk looks less btighter than the middle part. The limb darkening appearance is related with the optical depth, which explains a thickness of the absorbing gas in solar atmosphere. The solar atmosphere increases in temperature with depth. At the center of the solar disk an observer can see the deepest and warmest layers of the solar atmosphere, which emit most of light. On the contrary at the edge of solar disk an observer see only upper layers, that are cooler and produce less light. The limb darkening effect is seen through all solar filters both artifical and natural, where solar disk is sharp. 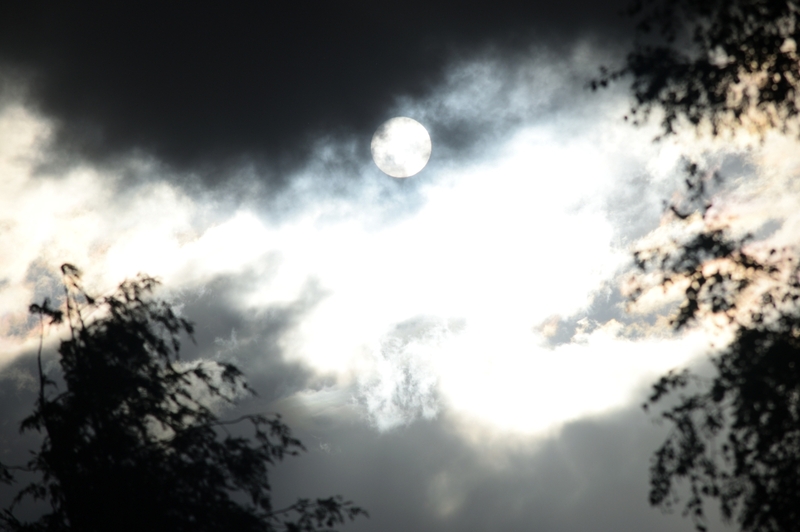 Watching the Sun through the cumulus cloud is a tricky issue and basically not recommended due to risk of eye damage. The major problem is, that well-builded cumulus cloud feature a sharp border between thick cloud and clear sky. In the effect the part of solar disk can completely blind you, whereas another part is still behind the thick cloud. Moreover cumulus, being a low-level kind of cloud (unless developed to congestus phase) moves relatively quickly across the sky against other clouds hanged on higher levels (taking into acciount, that wind speed remains the same on these levels), which explains the parallax phenomena. 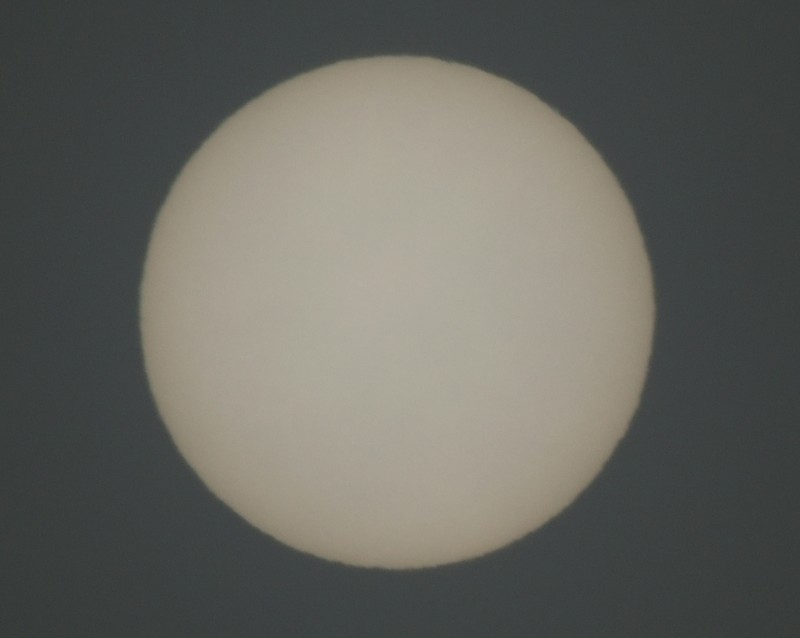 I took some random pictures of Sun, but only through the cumulus humilis, which is thin enough to let some direct light come through, making the solar disk visible. Cumulus fractus is too thin for observation such this, hence any attempts are not recommended because of serious eye damage and instrument burns too. 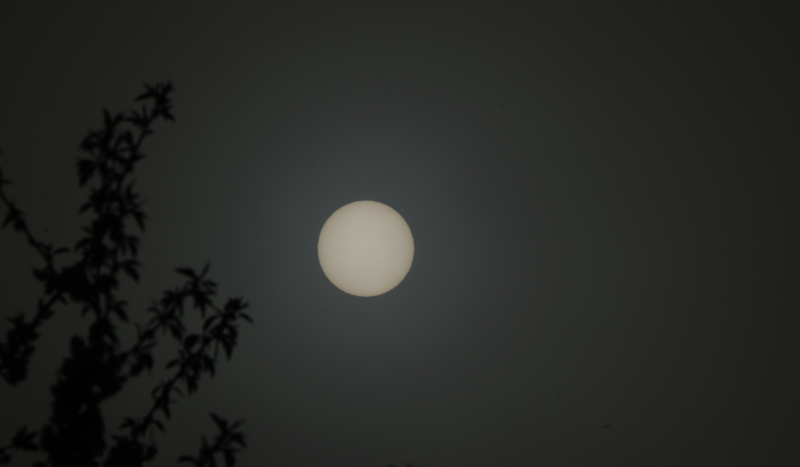 Unlike to foggy conditions, when solar disk usually appear uniform (Pic. 3-9), through the cumulus cloud it varies due to local cloud thickness (Pic. 10-14). Pic. 11 Sun as seen at the edge of cumulus humilis cloud. Exif: 300mm, 1/4000s, f/29, ISO 100, cropped. 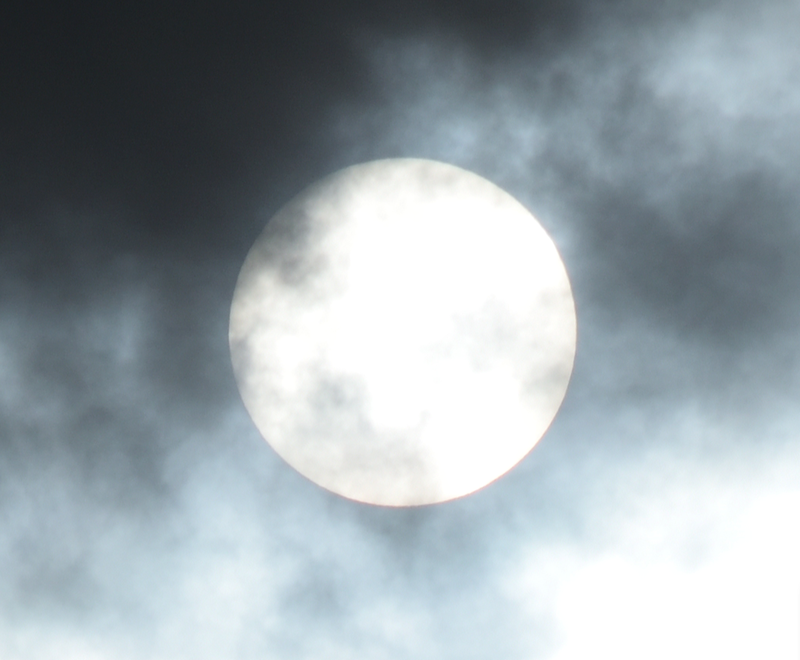 An analogue image of the Sun can be taken through the stratocumulus cloud. These mid-level clouds sometimes have a gaps or thinner spaces allowing solar disk to be visible. However not all species of stratocumulus are favourable for it. The most safe stratocumulus species for imaging of the Sun without filter are stratocumulus stratiformis, stratocumulus translucidus or stratocumulus perlucidus. Neverthelles it still can be dangerous enough to cause an retina burn, because these stratocumulus species can include a clear gaps or be too thin in places. The most dangerous and definitely not recommended kinds of stratocumulus for direct Sun image are: stratocumulus castellanus and sometimes stratocumulus undulatus. For stratocumulus castellanus situation is very similar to cumulus mediocris and cumulus congestus, where a border between thick cloud and clear sky is very sharp and clear Sun emerges suddenly. In turn, the stratocumulus undulatus can be thin enough to let a solar disk be visible, although the gaps between two separate cloud units are too big, at least on higher part of the sky. A bit more safely is when Sun is about to set or after sunrise. Then an perspective effect hides a clear skies appearing with undulatus cloud units alternately. On the opposite side, stratocumulus opacus doesn’t have any gaps and is usually very thick, unabling the solar outline to be visible. I did a few shots of Sun before sunset, through the stratocumulus stratiformis (Pic. 12-15). Pic. 14,15. 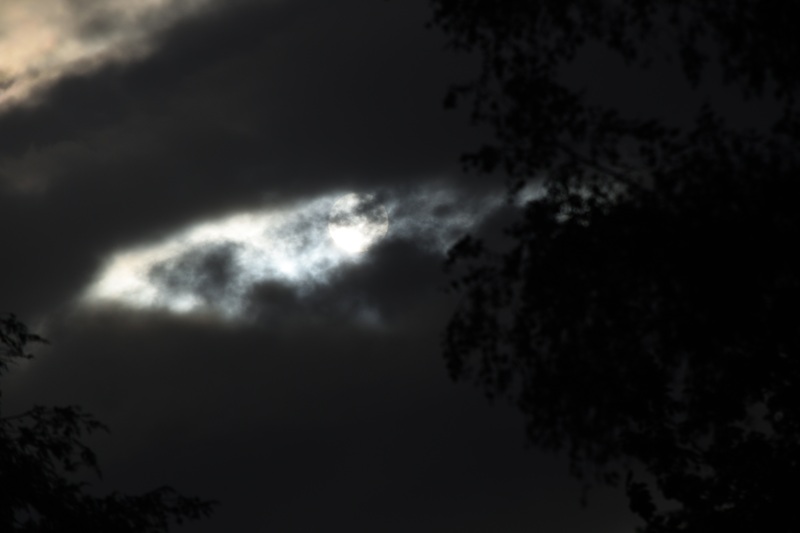 Sun visible through the stratocumulus stratiformis gap also with light transition effect, where closer cloud is much darker, than a further one, behind the sunlighted gap. Exif: 200mm, 1/4000s, f/8, ISO 100; 14 – normal, 15 – cropped. Click to enlarge. As you may have notice, the effect is pretty much the same as for cumulus humilis cloud. The nonuniformity of solar disk visibility is big and basically uncomfortable for observers, who want to spot something more. As a conclusion I would like to say, that I took these pictures only out of interests, and to be honest I don’t recommend this kind of observation for another people. Treat this article more as a curiosity and please do not follow me in this case! Unless you decide to take a picture of the Sun through the fog. Watching the Sun without the filters can be realy danrgerous. 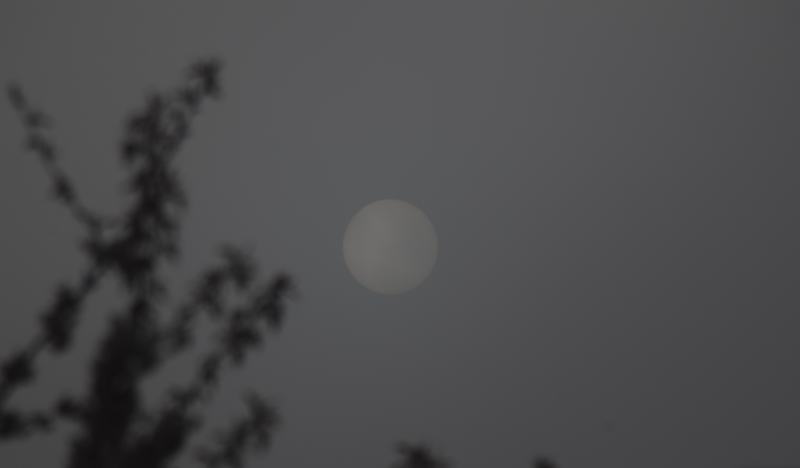 Only foggy conditions are the safiest, if you don’t have a decent solar filter in your equipment. Both cumulus and stratocumulus clouds are nonuniform in their thickness. It means, that one edge of solar disk can be barely visible, whereas an opposite one is too bright for your eyes. It may hurt your sight and damage your instruments. Even if you would manage the observation such this, it won’t bring you a valuable results. I took this observation only once and won’t repeat again. 3. 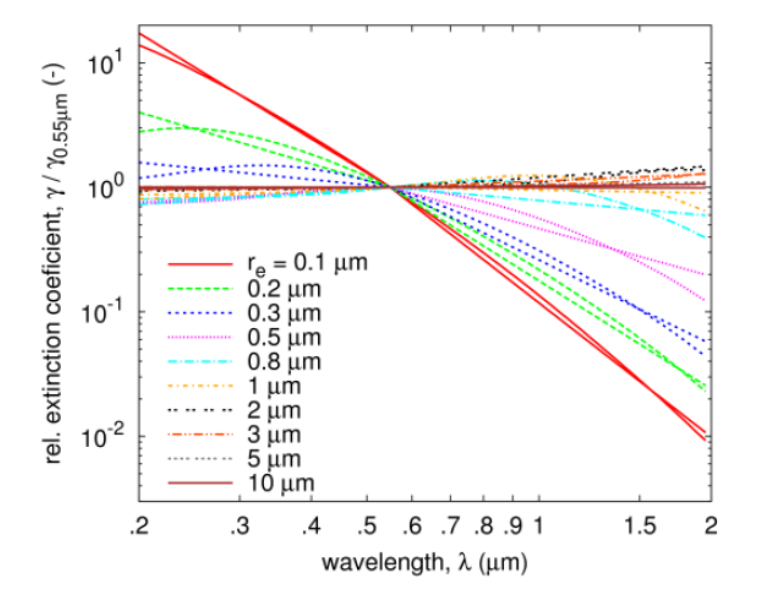 Grabner R., Kvicera V., 2011, The wavelength dependent model of extinction in fog and haze for free space optical communication, (in:) Optics Express, vol. 19, i. 4, p. 3379-3386.